I heard a rumor that there was a waterfall in Bankoulé, a village in northern Djibouti. Because the entire country averages 6.5 inches of rain annually, the image of water pouring over rocks with enough volume and force to create a waterfall compelled me to visit Bankoulé with my family. The village is 45 kilometers from the coastal city Tadjourah, the largest city in northern Djibouti and requires a rugged 4X4 to reach it. A single sign pointed in the direction of the village, or used to, before the paint faded and the sign tipped over. Now there was only a fork in the road. I took the path that veered away from a village called Randa and hoped it was the right guess. We inched around boulders and over tree roots and kept repeating out loud that this had to be the road. After all there was no other road and we knew Bankoulé wasn’t an imaginary place. At one point the path went over such a steep hill with such an abrupt drop off that I couldn’t see the road below and had to trust that rocks or dirt or something would catch the vehicle as it crested the hill. After ninety migraine-inducing minutes, we reached the tourist encampment, about a kilometer after the actual village, and stumbled out of the car, our legs wobbly as they tested out the firm, smooth ground after the intense bouncing and vibrating of the trek to get here. Rusted-out pickup trucks, heaps of trash, and empty gas cans tipped on their sides littered the parking lot. A narrow walkway led from the parking lot to an outdoor, roofed eating area, and a dozen huts, each equipped with beds, lanterns, and mosquito nets. A few bangles of silver tinsel were tacked to the walls of the eating area for decoration and seemed incongruous dangling next to a tusbah, a string of Islamic prayer beads. After dumping our belongings in the huts and drinking steaming tea, we prepared to hike to the waterfall. I wasn’t sure what we would find and tried to keep my expectations low. I’ve been to Niagara Falls, I’ve canoed on the Mississippi, I come from Minnesota, Land of 10,000 Lakes, I grew up with a river in my backyard. I love running water. And I have lived in Djibouti for twelve years. I know how little water there is in the desert, how unlikely it is to fall in substantial cascades. A Djiboutian pointed us further up into the hills. It would be impossible to get lost, he said. There is no other place to go. He was right, we walked through a valley and as long as we kept following the natural curves of the hills, we couldn’t wander off. Bankoualé Palm trees, Livistona carinensis, towered over us like gangly truffula trees from Dr. Seuss’s The Lorax. 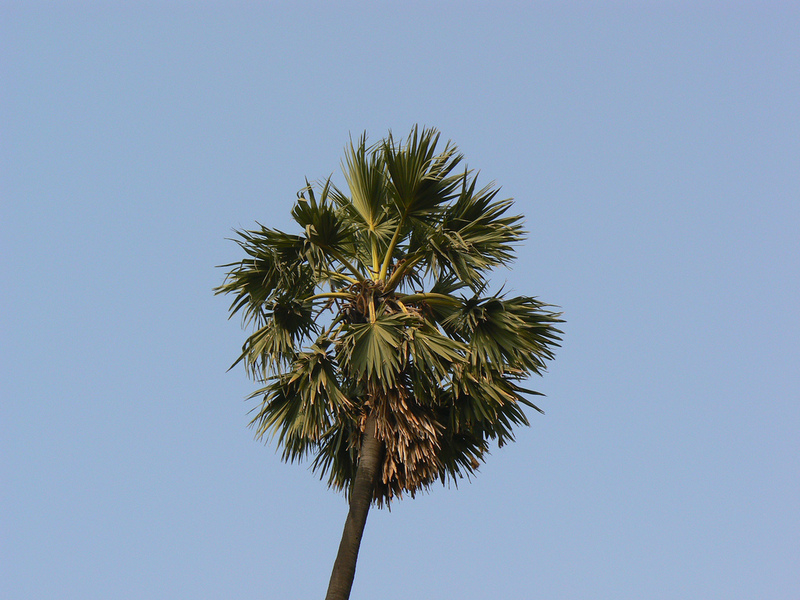 The palm is an endangered species and grows only in small patches of Djibouti, Somalia, and Yemen. In Djibouti there are fewer than 400 trees. Over-grazing causes most of the seeds and seedlings to be eaten and the only areas where young palms thrive are in gardens where they are protected from grazing and winter flooding. The tree trunks are skinny, I can easily wrap my arms around them but the trees are over 40 meters tall, topped with small bursts of fanlike palm leaves. Hawks perched on top of several trees and occasionally swooped down over the valley in pursuit of mice or lizards. A man leading a camel passed us. He had come from up the valley. His camel carried a mat and sticks designed to hold cargo. He would return later that night or the next day with jugs filled with water and with piles of sticks or boxes of food staples, medicine, or schoolbooks strapped to the camel. Vehicles couldn’t pass this way and remote villages relied on camels and donkeys for supplies. Bright clothing spread over the gray rocks were the first sign that we were nearing the waterfall. Women hand washed dresses and scarves in the tiny streams that trickled through rocks and draped their clothing like red and orange flowers over bushes and stones to dry. I thought maybe we would hear the waterfall before we saw it. The pounding rush might drown out the sounds of the wooden, clacking camel bell or the sounds of my youngest daughter endlessly singing the same song. But there was no pounding water. The drying clothes remained the only clue that water was nearby until we stood directly beneath the waterfall. “Is this it?” my son asked. A pipe with the circumference of a garden hose poked out from a rock in the side of the hill. A small but steady trickle of water flowed from the pipe and dribbled down the rocks to the valley where stones divided it into even smaller rivulets that ran for a few meters, the widest about a foot across, and then dried up. The force of the flow approximated what I would use to wet my toothbrush. We each dipped our hands into the water and flicked droplets into each other’s faces. It was cold and clean, not salty like piped water in the city. We didn’t stay long at the waterfall, there wasn’t much to do. We walked back down the valley and into Ardo Village. We arrived during the afternoon resting time and the only sounds came from a home under construction. Men squatted on the roof of a domed, circular house, finishing the stick and grass roof for a newly married couple. Children ran up to us and grabbed my kids’ hands and pulled them toward the only public building in the village, a blue and white school. One of the rooms was entirely devoted to baskets and handicrafts for sale to tourists. Unfortunately there aren’t many who venture this far inland. Thick layers of dust covered the crafts, which were stacked in precariously balanced pyramids to make room for everything. My kids each picked out a few items: baskets, coin purses, and small knives with leather sheaths. The next morning I woke early and watched yellow-billed hornbills flit amongst the powdery acacia trees at the camp. I hadn’t really expected to see a waterfall so it was hard to call what I felt ‘dissatisfaction’ but at the same time, I felt vaguely despondent. “No one of consequence,” the man in black says. “I must know,” Montoya continues. “Get used to disappointment,” the man says. Living abroad is not all adventure or Eiffel Towers or decadent meals or exotic beaches. It is often an experience to which the only response is, “get used to disappointment.” Meaning, it is often mundane trips to the grocery store, school lessons, business meetings, and day-to-day, unexciting trickles of water out of rocks. As I sat on a rock and sipped bitter Nescafe and reflected on the various metaphors I could pull from this hunt for an illusive waterfall, the last person I expected to see was Jesus. A man with long brown hair and a full beard walked past me. He was barefoot and wore strange clothes, a tunic-like shirt, tattered shorts. He skin was brown and leathery from the sun and his fingers and toes were covered in dirt as though he had come from a hard day of farm work. One of the camp employees saw me watching the man. I laughed. “Jesus?” He used the Anglophone word, not a French Jésus, not Arabic Ciise. Not Afar or Somali. “How did Jesus get to Bankoualé?” I asked. I laughed again. Waterfalls that were really water piped down a mountain. Jesus strolling through my camp at breakfast. The despondency lifted. So much for expectations. Rachel Pieh Jones lives and writes in Djibouti City.